We all know that Epiphone is considered as Gibson’s brand that makes affordable entry-level guitars. Even though that is true, the guitars they make are definitely better than some of the guitars that are made from independent brands. The Masterbilt DR-500MCE can be considered as a great guitar for beginners and for professional players because it has features that can be appreciated by both of the player categories mentioned. The Epiphone Masterbilt DR-500MCE is an acoustic-electric dreadnought guitar which has a great build quality and amazing sound. 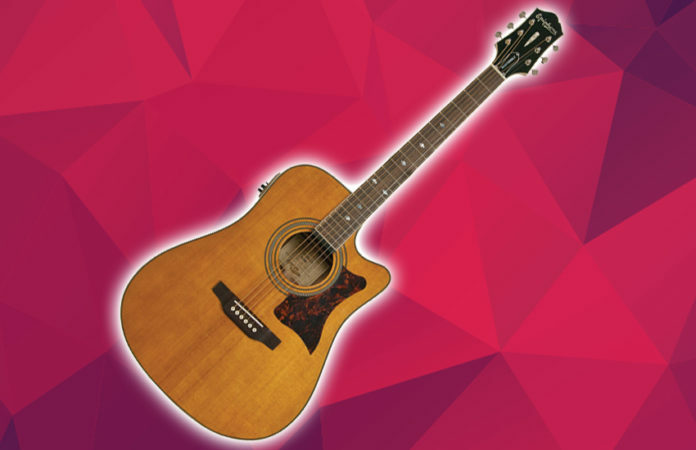 It has a solid sitka spruce top which is available in two colors: Natural & Vintage sunburst. As soon as you get this guitar on your hands, you will notice the quality of the mahogany sides & back. I personally think they look stunning, especially because of the vintage look. Like it is with most Epiphone acoustic guitars, the fretboard and bridge are made of rosewood, which is my favorite material when it comes to the fretboard. People often skip this part and only focus on the body material, then regret their purchase 2 months later because they can’t play their guitar comfortably. That’s why, the first thing you should look for when buying an acoustic guitar is the neck & the fretboard. If the quality of the neck & fretboard is not top-notch, then playing it will be very difficult, because you will struggle to move your hand up and down the neck, and that makes playing the guitar pretty hard. The design of this guitar overall looks stunning. It’s hard to make a guitar that looks good without compromising on the playability, but Epiphone did a good job with the DR-500MCE when it comes to that. The stylish detailing, the pearloid split diamond inlays and the pickguard definitely make this guitar stand out from the rest. When it comes to the hardware, the Grover Sta-Tite nickel machine heads and the bone nut that sits below it is worth mentioning. I was surprised that they didn’t use a synthetic bone for the nut of this guitar like they did on some previous Epiphone models, but that’s understandable considering this guitar is a high-end Epiphone guitar. As we mentioned earlier, this is an electric-acoustic guitar, meaning that you can play it both plugged in and unplugged. It features the eSonic-2 Stereo preamp which can be useful for people that gig often. When it comes to the sound, i want to talk about both the plugged-in and unplugged mode. If you decide to play the guitar unplugged, you will see that it’s a very powerful guitar that has a bright and lovely tone which is similar to the mid-range Gibson’s. Considering it has a solid Sitka spruce top and mahogany back & sides, you can expect really good things from this guitar, no matter if its plugged in or not. Overall, I would say that this guitar is a perfect option for advanced guitar players that want to ditch their old guitar and get a new one. It provides you serious value for your money, and that’s what we all are after.